Hemel Hempstead Town staged a dramatic late fight-back to salvage a point in a 1-1 draw with Conference South table toppers Bromley at Vauxhall Road. The high flying visitors looked to have snatched all three points when they took the lead in the 93rd minute through Jamie Slabber, but Hemel hit back immediately as Luke Allen raced up the other end and chipped Bromley keeper Alan Julian to earn the draw. 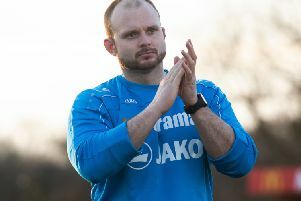 Hemel felt they should have gone in at half-time in front but they just couldn’t force the breakthrough, with the normally deadly Jordan Parkes firing two free-kicks off target. Bromley’s first real effort came when a corner was missed by Hemel keeper Laurie Walker and almost crept in, but Ed Asafu-Adjaye cleared off the line. The second period was a fairly even affair, but the sending off of Hemel’s new signing Ed Oshodi for a second yellow card changed things – with Bromley piling forward in the last few minutes to try and get a winner. The pressure finally told in the third minute of stoppage time when Slabber forced the ball home from close range to the delight of the Bromley fans, players and bench who celebrated as one in the corner – with Slabber receiving a yellow card for removing his shirt. It looked like it was going to be heartache for the ten man Tudors, but returning loanee Allen was the hero as he scored via a slight deflection to send the home fans into raptures. There was a nice touch by the Tudor fans who held a minute’s applause in the 44th minute for 44-year-old Hemel-based Watford fan Nick Cruwys who is in hospital after an unprovoked attack after the Hornets’ game against Wolves last week.